Leslie Kay Coday Kissel was born in Denver, Colorado on August 2, 1957, the daughter of Mary Coday Checots née Hale and Don M. Coday. She is survived by her husband, Tim; her daughter, Carly; her sons, Sam and CJ; her mother, Mary; and her sister Laura and brother Mark. Leslie graduated from West High School in Denver in 1975. She met Tim while working at Montgomery Ward in Denver, and two years later, they married. After nine years of marriage, they had their first child, CJ; their second, Sam, followed four years later. The birth of her youngest, Carly, motivated Leslie to join the rest of her family in the Catholic faith. She began the long Rite of Christian Initiation for Adults process, and in 2001, she was baptized. In 2003, she and Tim renewed their marriage vows in the Church. She went on to teach religious education classes to children for 14 years. 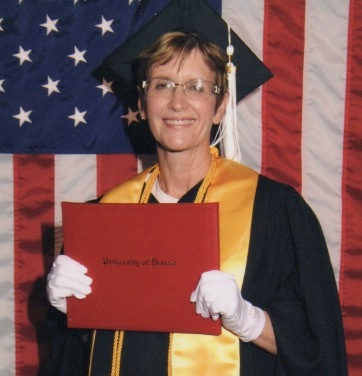 In 2011, Leslie achieved her longtime goal of earning a bachelors degree, from the University of Denver. The sacrifice and determination she showed in pursuing this goal — spending nights in the classroom after long days at work; studying for hours at the kitchen table — continue to inspire the rest of her family. Leslie poured every ounce of her life into raising her family. She never missed a band concert, school play, baseball game, or softball game. She lived with an open heart, and made friends everywhere she went — from her longtime workplace, to her frequent fitness classes, to her passionate service at her church. When she wasn’t working, she enjoyed mornings in the garden, afternoons watching cooking shows, or evenings by the fireplace with a good book. She expressed her love for her family in part by cooking delicious meals, which they all shared at the table (or, on occasion, in front of a spirited game of Jeopardy). In late 2018, Leslie was diagnosed with pancreatic cancer. As she did with all obstacles she encountered in her life, she faced it with grace, dignity, and courage. She passed away at home, in Aurora, in the presence of her devoted husband. Her family will always remember her as a tenaciously hard worker, a strong, warm spirit, and an unfailingly caring mother and wife.